As part of Kantar-GeoPoll Media Measurement‘s daily surveys on audience habits for TV, radio, and print, GeoPoll is pleased to release this report on top TV and radio stations, popular viewing times, and more for Q1, 2016. To learn more about KGMM, see a demo of the system, and sign up for an account please contact us. NTA and AIT have the highest ratings throughout the day, but with NTA’s peak viewing time coming in the evening from 21:00 to 22:00 each day. NTA’s highest rated time slot is on Thursday evenings from 21:30 to 22:00. AIT also has its highest ratings on Thursday evenings, indicating this is a popular weeknight to consume television. Amongst male audiences, we find that AIT and NTA lose share to Channels TV, Silverbird, CNN and OnTV. Despite generally low ratings for BBC and CNN, male audiences have high affinity for these two stations. Affinity is a measure of loyalty, and higher affinity scores demonstrate that a particular audience is watching or listening to that station frequently. Female viewers spend less time on AIT, Channels TV, and NTA, and more time watching Galaxy, Silverbird, OnTV and Africa Magic. Female audiences have high affinity to Zee Cinema and Africa Magic Yoruba. Due to the proliferation of local radio stations throughout Nigeria, national radio listenership is highly fragmented, with 52% of the audience share going to stations which do not get more than 2% national share. 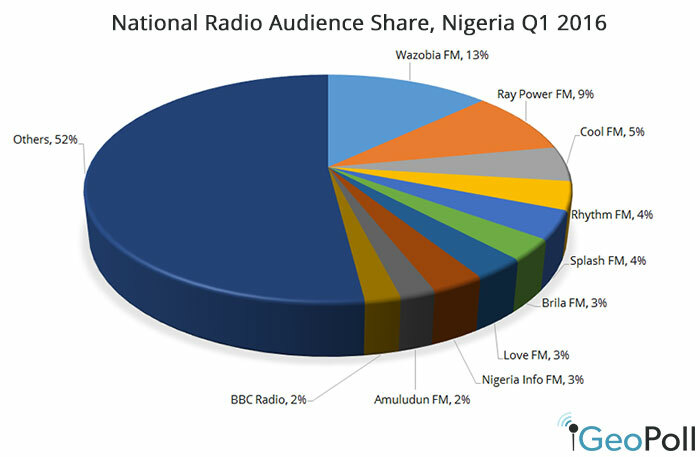 As seen in Q4 2015, nationally Wazobia FM, Ray Power FM, and Cool FM are the top stations, with 13%, 9%, and 5% average audience share. Radio listenership is high throughout the day, with many stations seeing a decline in listenership on Sunday evenings, followed by relatively high listenership on Mondays. Wazobia FM shows higher audience share than other stations on Fridays, with a spike in audience share on Friday evenings from 20:00 to 22:00. Examining the demographics of audiences for radio stations, we find that Splash FM and Cool FM appeal to younger listeners, whereas Wazobia, Ray Power, Nigeria Info and Rhythm FM appeal more to older listeners. Overall Wazobia and Ray Power have higher share with females than males. Male listeners have the highest affinity for BCA FM, Nigeria Info, Brilla FM and Bond FM, and females have high affinity for Ajilete FM.